The Louisiana Department of Health and Hospitals- Office of Public Health provides an Annual Hospital Inpatient Discharge Database Report (LAHIDD) available to the public. Their goals are to monitor and evaluate health problems, support health research projects, and to evaluate the development and advancement of their ‘Health People 2010’ health promotion. The website offers a collection of Vital Records (e.g. birth and death certifications, or marriage licenses) which consumers can purchase. 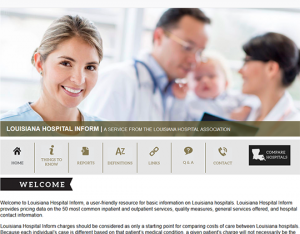 The State Health Care Data Clearinghouse plans to develop a querying system where the raw data of Louisiana’s Hospital Inpatient Discharge Data can be stored. LAHIDD provides information to evaluate morbidity and hospital charges associated with inpatient stays in the state. Data collected is updated periodically. This is a 2004 report consisting of mostly of annual data updates. There is also a 2006 Louisiana Health Report Card which consumer can view. This is the ninth annual health report card being published by the Department of Health and Hospitals. Topics include: morbidity rates, suicide rates, violent deaths, results of preventive health outreach programs, and more. Comparisons are made on the data from prior years along with associations among other states. The data is also updated periodically since there are several data sources, each with their own updates (e.g. Louisiana State Center for Health Statistics, National Center for Health Statistics, United States Census Bureau, Office of Public Health, etc. ).